I'm started to suspect Person Of Interest doesn't think very highly of me. How else can you explain its ongoing need to repeat and over-explain every plot point and theme? In tonight's episode, "Mission Creep," we were spared much of last week's restatement of purpose moments, but in exchange, Reese and Finch were constantly telling each other (and, of course, us) what the plan was, what they needed to accomplish to achieve that plan, what dangers were threatening to prevent them from accomplishing what they needed to accomplish, and of course, what the plan was. Equally as tedious were the frequent labored explanations describing the emotional turmoil of this week's PoI, one Joey Durban, ex-Marine and erstwhile bank-robber. Joey, you see, never came home from the war. No, he never did. See, it looks like he's back in the States, but really, he's still fighting the war. Because of all the turmoil and emotional suffering and so forth. There are undeniably stories to tell about soldiers who return home from Afghanistan and find themselves struggling to deal with a broken economy and their own traumas, but "Creep" doesn't really tell a story like that. Again, it's roughly the same sort of base level of quality we've see in the other two episodes of the show so far, generating a sort of low curiosity regarding its central mystery and a mild interest in seeing the plot arrive at its inevitable resolution. Unfortunately, this week, we've shifted our focus off of Finch and onto Reese, getting a glimpse into his backstory, and we've cut back a bit on the action sequences. The cold open, which has Reese becoming inadvertently involved with a bank robbery, is strong, as were the few moments of humor scattered throughout the hour. (Most of which revolved around Finch.) There's also a twist ending that marks the arrival of a proper villain, someone who will most likely be with us the length of the season or, who knows, maybe even the series. He'll most likely have some kind of tie to either Finch or Reese, maybe both, but for right now, all we know is that his name is "Elias M.," or that he (or she!) has an interest in a police case file under that name. This week's plot: Joey Durban is a soldier back home from the war, now working as a doorman and spending his free time in an impressively efficient gang of thieves. The gang is made up of ex-military, led by a bartender (and former officer) named Sam Latimer, and Reese has to infiltrate the gang in order to determine if Joey is going to be the target of violence, or if he's going to be responsible for killing someone himself. After following Joey around for a bit, Reese learns that he's giving money to a young woman who has a daughter, who turns out to be the daughter of someone Joey knows, someone who died overseas. So Joey feels responsible and is trying to make amends for the kid, which means robbing banks and gambling joints and what have you and also means that he's keeping himself at a distance from his fiancee. So Reese runs some interference, while we learn (via Detective Carter) that the reason the ex-military gang has been holding together so efficiently for so long is that Latimer has a tendency to shoot members of his gang when they've been on the job too long. It's at once sort of complicated and pretty simple. As is becoming routine with this show, there were bits and pieces I liked (the way Finch makes a hole in Joey's gang by framing another member with guns in the trunk of his taxi, for one), but there's a lot of generic plotting and double-crossing here. So far, none of the PoIs we've met have been particularly interesting, and the stories don't really work as escapist fun or effective drama. The weirdest scene in "Creep" has Reese and Joey getting in a fight with a pair of bankers in a bar; one of the bankers, for reasons that defy understanding, starts lecturing the veterans about how it's hard being a banker too, and no one asked them to go to war. So Reese headbutts one of them and Joey punches the other. It's very silly, and utterly ridiculous, but it at least feels like the show was trying to make some kind of statement, even if it got lost in the absurdity. It's also unusual that Reese lets Joey go in the end; again, it doesn't really make much sense, but at least it's not entirely typical. 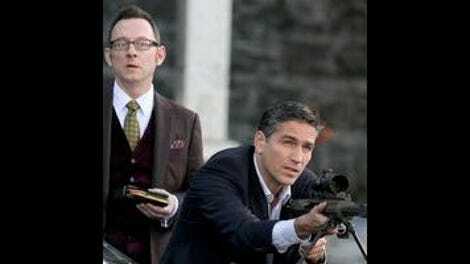 Person Of Interest doesn't need to be the next great drama on television to be effectively entertaining, but if it's going to keep churning out b-level plots like this one, it needs to do more with its two leads. (I'm not sure what you can do with Det. Carter. She's basically just a superfluous expository device at this point, and unless she starts feeding Reese and Finch information, there's no real reason to keep her around.) Reese on his own isn't much fun, but he and Finch play off each other well, and the series would be smart to try and get them in more scenes together, as opposed to Reese running around on the street while Finch hides in his abandoned library. As far as ratings go, the series is pulling solid, if not spectacular numbers, which, unless something drastic happens, gives it good odds for sticking around the full year. If it does, I hope they realize that Finch is the best edge they've got and act accordingly. Too many more episodes like this one, and I might forget to watch completely. Finch doing push-ups after Reese tells him he should get in shape? Comedy gold. "You're still fighting the war." Someone actually says this. The 2006 flashback: Reese meets Jessica. She's engaged to a guy named Peter, and she wants Reese to ask her to wait for him. He says "Wait for me," but only after she's too far away to hear him.